If you are visiting Utah, consider adding Park City skiing to your itinerary. This area has a lot to offer skiers of all ages and ability levels. 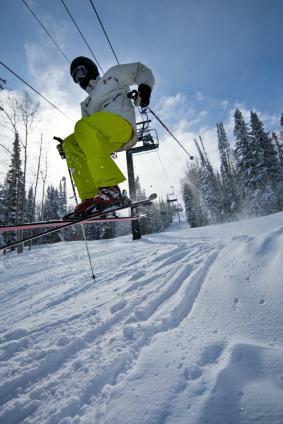 Park City skiing typically runs November through April. Of course, this depends on the weather. Typically, Park City receives 360 inches of snow annually. Two resorts to check out in Park City are Park City Mountain Resort and The Canyons. Park City Mountain Resort is located just 37 miles from Salt Lake International Airport. It offers some of the best skiing in the United States and was host to the Winter Games in 2002. This family friendly resort has a range of activities that will make any winter vacation unforgettable. Not only does Park City have over 100 trails but it also has unique ski programs for kids as well as adults. Another resort located in Park City, Utah is The Canyons. It is one of the largest resorts in the United States and offers adventure packed activities for people of all ages. Located 32 miles from Salt Lake City, this area is known for its great skiing as well as shopping and dining. The Canyons has a base elevation of 6,800 feet and a summit of 9,990. It offers 4,000 acres of skiable areas on nine mountain peaks and five bowls. There are 19 lifts servicing 182 trails. The Canyons also has Heli-Ski Tours of the Wasatch backcountry. Lessons are available at The Canyons Ski and Snowboard School. Coaching programs focus on the individual skier's strengths resulting in quick improvements. There are both private and group lessons as well as ski clinics. Children lessons are offered for kids ages 2 to 14. There is also daycare services available. Skiing is the most popular winter activity at The Canyons but there are a range of others to check out such as sleigh rides, snow groomer rides and drives, dog sledding, snowshoeing and snowmobiling. The Canyons also has cross-country skiing. To take a break from the outdoors, try one of the many restaurants or browse through the Village Shops. Park City has 3,300 skiable acres consisting of eight mountain peaks and nine bowl areas. The base elevation of the mountain is 6,900 feet and the summit is 10,000 feet. There are trails to match any skier's ability level and some to challenge the most experienced skiers as well. With 114 trails, 31 percent are classified as most difficult, 52 percent are more difficult and 17 percent are easy. The longest ski run, Homerun, is 3.5 miles long. There are also three terrain parks and one superpipe. Getting up the mountain is simple since there are 16 ski lifts as well as a Magic Carpet. Taking a lesson is not only a great way to brush up on your skills or learn new ones but a way to see what slopes the resort has to offer. Park City offers instruction for both children and adults. There are group and private lessons designed for fun as well as learning. The Signature 5 Program is tailored for kids ages 6 to 14. It gives a range of instruction for young skiers of varying abilities. With small class sizes, kids are guaranteed close supervision and superb instruction. They also will be given a lunch at one of the restaurants on the mountain. Adaptive lessons are available through the National Ability Center for those with disabilities. In addition to skiing, Park City has a range of other activities to offer its guests. There are several dining options from the most casual to the finest dining. Park City has a lot to offer skiers of all ages and ski levels. With a range of options to choose from, finding the area that best matches your interests is easy. Consider a ski vacation to Park City for an unforgettable experience!